Reducing unnecessary waste and maximising the amount of product on each roll, these Coreless Toilet Rolls 36 x 96m are designed for use in a specialist dispenser and have been designed with a drop down roll system that allows immediate access to toilet paper once the primary roll is finished. Made from an absorbent and soft 2ply paper, these rolls have been uniquely designed to aid in the reduction of waste in all work environments from primary schools through to care homes. 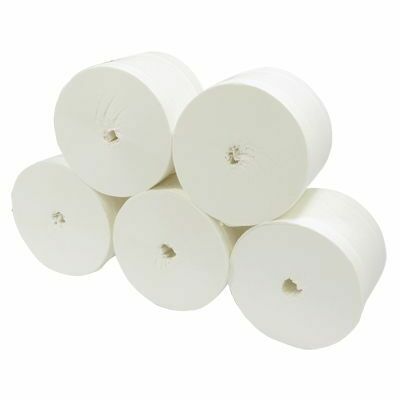 Per roll, you will receive approximately 834 sheets of high-quality toilet paper making them perfect for high-traffic toilets in reducing the number of times a replenishment is needed. Choose to be mindful of the amount of wasted product your business puts out into this world with these ingenious toilet rolls. Alongside these, we also stock a wide range of other Toilet Roll options at exceptional, wholesale prices.